Actor Aamir Khan is known for always changing his look according to the character in his films. The last time we saw him at a public event, he was sporting a mustache look for Reema Kagti’s film Dhuan. Now the 46-year-old has been spotted at a public event in Mumbai and this time with what seems to be his new avatar for Dhoom 3, in which he will be playing the villian. The Bollywood actor was posing for photos and proudly showing off his new look. This new suave look shows him in cropped haircut with a sophisticated salt and pepper French beard. Although the buzz is that this is his new look for Dhoom 3, no official confirmations has been made. The third installment of Dhoom 3 will hit the theatres in 2012 around Christmas. Abhishek Bachchan and Uday Chopra will be seen in their roles as Jai Dixit and Ali Khan and Katrina Kaif has been cast opposite Aamir Khan. 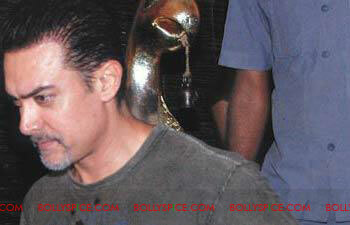 Though we hear this new look is for test shots for Dhoom 3, Aamir is set to begin shooting for another schedule of Dhuan in London this month so in truth, it could be for that as well. We will have to wait and watch to see whose character he is playing with this cool look, but you can be sure whether it is Dhoom or Dhuan we will bring you all the exclusives.